Wycombe have named 46-year-old goalkeeping coach Barry Richardson on the bench for their FA Cup third-round tie against Aston Villa. Matt Ingram's red card against Morecambe on Saturday means he is suspended for the match, allowing a start for 20-year-old Alex Lynch. "We've got no one else we can put in there," said boss Gareth Ainsworth. "That's Wycombe, you get your chances." 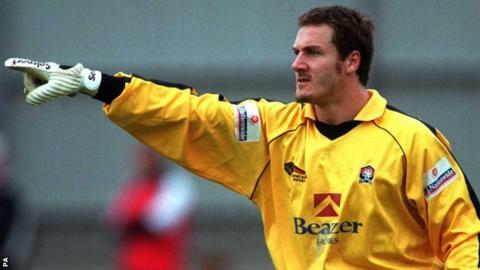 Richardson last played a professional game for Doncaster in 2005. In that Football League Trophy match against Cambridge, Richardson suffered a broken leg that has effectively ended his playing career. Since then, he has been a regular unused substitute for Nottingham Forest, Cheltenham, Peterborough - including being on the bench for their 2011 League One play-off final - and Wycombe. At 39 years and 287 days, David James became the oldest goalkeeper to appear in an FA Cup final, playing in Portsmouth's 1-0 defeat by Chelsea in 2010.